Bring whimsy and smiles to your front porch with this hand-cast bronze doorbell cover. Handmade in Pennsylvania by artist Rosalie Sherman. Includes a gold-rimmed doorbell push button and two brass screws for assembly/mounting. Could it be that "Dogs Playing Poker" was the seminal work of art that made Rosalie Sherman want to be an artist? Or was it the movie "A Horse's Mouth" starring Alec Guinness as a painter seeing every wall as his canvas. Whatever the reason, Rosalie pursued her dream. She graduated Philadelphia College of Art in the '60s and has spent the following decades exploring a variety of materials: wood, fabric, steel, aluminum, clay and now pewter and bronze. After she became an Artist in Residence at Artpark in 1981, where she made a 12-1/2 foot tall "Doghouse" (a bull terrier out of lumber and aluminum siding), Rosalie spent the next 15 years making site-specific public sculptures. She has made sculptures/benches for parks in Pennsylvania, animal seating for a subway stop in Boston, dog and cat sculptures for the front of a county animal shelter in Florida, play sculptures for a children's hospital in Oregon and benches and sculptures for schools in Maryland. Now, she's turned her attention to everyday surroundings, making affordable sculptures for the home. In her studio outside of Philadelphia, she creates hooks that are giraffes and penguins, knobs of dogs named Bob and a myriad of animals and people you could hang your hat on, literally. It pleases Rosalie to know her little cast of characters are opening cabinets and holding brooms in the homes around the world. 2" L x 2.6" W x 1" D; doorbell button: 13/16" dia. 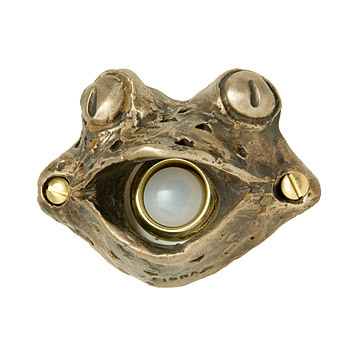 Frog Doorbell Cover has been discontinued. When it sells out, it will no longer be available. It was a gift for the difficult to shop for. He loved it. It was a little smaller than I expected, but good quality. And it came with the a new doorbell, so that was a bonus. best part is "made in the USA" ! Doorbell cover... everything about it was great! I purchased the item for a friend who teaches science and has many animals in her classrooms including frogs. She has installed it and loves it. She gets great comments from friends when they visit. It looks great on our front door. I think it is very cute and fun. The best [$] home improvement ever! I smile every time I walk up to my front door. This doorbell was easy to install and looks great - heavy casting and fun detail - it is a whimsical addition to my new home and I love it! A different sort of welcome. This welcoming doorbell is sure to have your guests smiling when you answer the door. It is solid and obviously handcrafted-letting folks know you take your humor seriously! Was going to give it as a gift but seeing it now I think I will keep for myself. Would buy again!